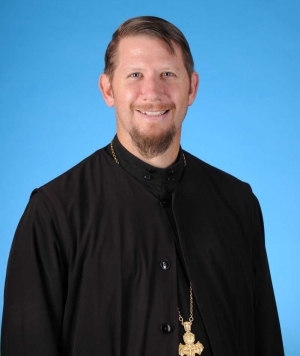 Alumnus Father John Parker is rector of Holy Ascension Orthodox Church in Mount Pleasant, South Carolina. Father John earned his Master of Divinity degree at Trinity Episcopal School for Ministry in Ambridge, Pennsylvania. After serving for a brief period as curate at Holy Cross Episcopal Church on Sullivan’s Island, South Carolina, he and his wife, Matushka Jeanette, along with their two sons, embraced the Orthodox faith in 2002. Father John went on to earn his Master of Theology degree at St. Vladimir’s Orthodox Theological Seminary in 2004. In October 2011, he was appointed Chair of the Department of Evangelization of the Orthodox Church in America (OCA). Father John is a regular contributor to the “Lord Send Me” podcast series  on Ancient Faith Ministries. In his latest podcast, “Remembering Fr. Thomas Hopko,”  he recalls “Father Tom’s” enormous influence on him and his family during his days as a seminarian at St. Vladimir’s. Father John may be reached at 843-881-5010 or evangelization@oca.org .